The Daily Dose: Fashion police? Whatev. Just give me a cookie! they are comfortable. I'm such a rebel. So I learned something this morning and feel it's my duty to warn you: If you go out today, make sure you're wearing brown shoes. Yes, today is Wear Brown Shoes Day, one of those wacky holidays created by someone who, at least in my opinion, has a little too much time on his (or her) hands. The only brown shoes I own right now are three-inch heels, not exactly the perfect match for my typical mom uniform of yoga pants and a T-shirt. 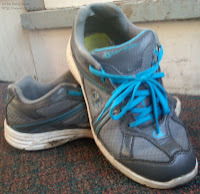 So, rebel that I am, I'll be traipsing through the grocery store in my beat-up gray sneakers with turquoise laces. Come and get me, fashion police! So tell me, friends: Will you be wearing brown shoes today? And more importantly, will you be eating cookies? This inquiring mind must know! You're right in style. Go, you! What if I eat brown cookies . . . does that count??! Yum, can't wait to celebrate!! It does in my book. Enjoy! I'll definitely participate with a cookie! I don't have any brown shoes, and I don't think we have any cookies either...I may have to eat some tomorrow to make up for not having any today! I will not wear brown shoes, because I'm a rebel, too! I'll wear white sneakers. And of course I will eat cookies. How could I not? LOL! If you don't have brown shoes, then a little dirt can help! I actually wore brown shoes today, and I didn't even know I was being cool. :-) I'm on jury duty this week...my first time, and I dressed nicely w/ dress brown shoes. I'd rather have a cookie, though, too, than spend time being fashion trendy! In style and you didn't even know it! I wish every day was cookie day. And I'm with you on those weird "holidays". Who set them up and why??? I didn't have any cookies today, but I did indulge in some chocolate. It's a good day!